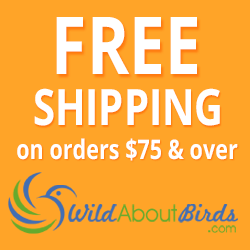 Birds are fascinating creatures whose temperament is known to change (often with the seasons). Many birds play well with others year-round, while others can be downright hostile. 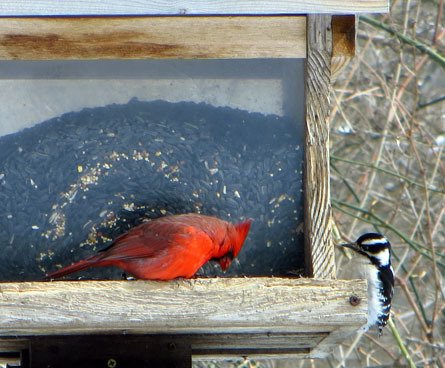 When food or water becomes scarce; however, birds will often come together at bird feeders and birdbaths. 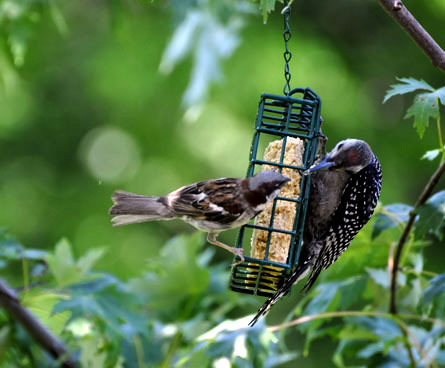 Woodpeckers are active birds that frequent suet and nut bird feeders. If small birds are there, the larger woodpecker will often chase them off. In the bird world, size matters! 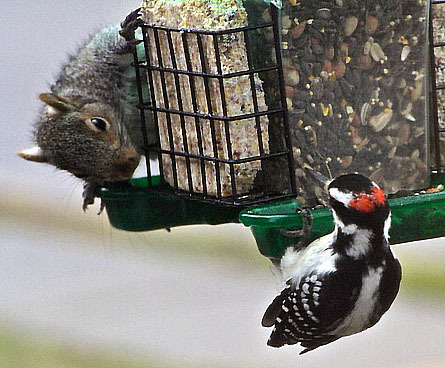 Sometimes; however, they will tolerate sharing a feeder with other birds or in this case — a squirrel. I'm not sure which one was more surprised or who blinked first, but it makes a great picture! During mating season cardinals are extremely aggressive towards other cardinals, but as the season passes they become more accepting of other birds and less territorial. 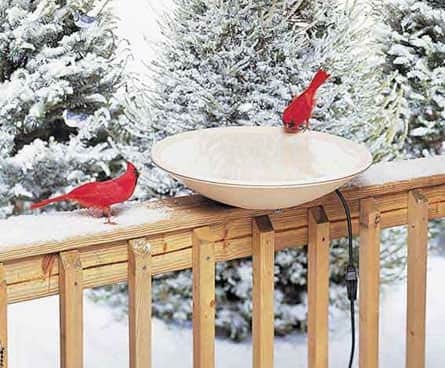 In this case, two thirsty male cardinals share a heated birdbath in winter. Throughout the year and especially as it gets colder, many non-migratory birds can be found together at backyard bird feeders. 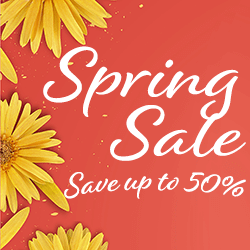 Chickadees, sparrows, finches and other small birds are easy to find hanging around a good food source or birdbath. Their shared preference for birdseed (which usually is found in feeders that accommodate multiple birds) brings them together. When the leaves fall and there is less foliage to hide behind, the smaller birds find safety in numbers. Hungry hawks are always on the lookout for their next meal, so the smaller birds stick together and collectively keep an eye out for birds of prey. 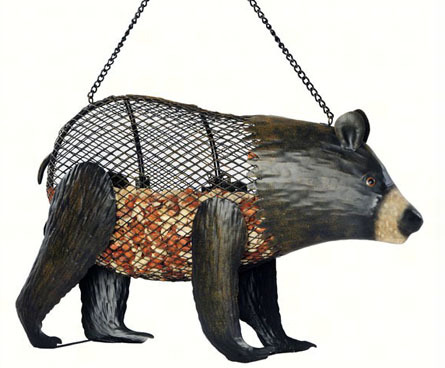 When you think of predators, you usually thing of something smaller than this bear. 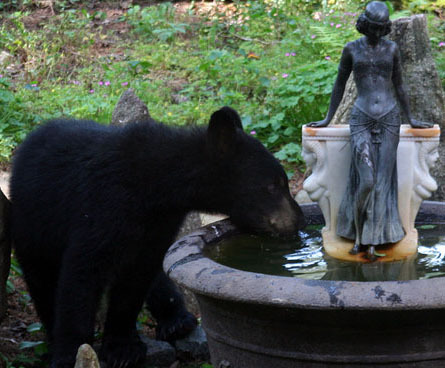 If your bird feeder or birdbath is attracting bears, you might want to re-think your approach. One of these bears you want and one of them you don't!